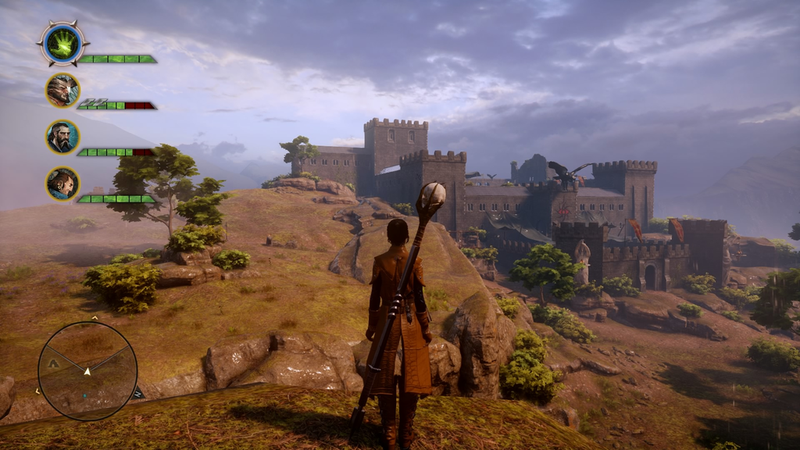 Just a year before it came out, Dragon Age: Inquisition looked very different. And I'm not just talking about trivial things—UI changes, line tweaks—what we saw in 2013 was almost an entirely different game than what we saw last year. 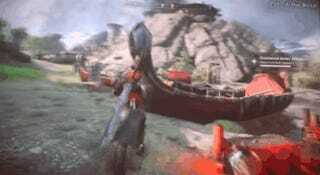 At PAX Prime in early September of 2013, BioWare showed off a 30-minute demo of the newest Dragon Age game. It was our first time really seeing it in action, and what we witnessed was spectacular: a big, beautiful RPG that tasked you with making important, tactical combat decisions like burning boats to prevent your enemies from escaping or smashing down a rickety bridge to take out the enemies standing on top of it. What we actually got was something else entirely—Dragon Age: Inquisition did turn out to be a great RPG, but much of what we saw during that first preview session never actually made it into the game. This isn't that unusual. Game development is a messy process. Things change. But still, I thought it'd be interesting to go back through that old demo and dissect just how much they had to change—and cut—between September 2013 and November 2014. Unfortunately, BioWare never released an official version of their presentation, so all we have is an off-camera recording, via YouTuber ShepardN7, separated into three main parts. If you've played Dragon Age: Inquisition, you'll probably immediately notice that this doesn't look like Crestwood at all. In this video we see a vivid, thriving area filled with soldiers and castles; the Crestwood we got in Inquisition was gloomy, rainy, and infested with demons—at least until we completed a certain sidequest. But even after that, it didn't look much like the Crestwood in the video.. The PAX demo also showed a timer bar called "Inquisition Keep Strength"—a visual representation of enemy forces attacking one of your keeps, which presumably would have a big influence on how quickly you had to complete missions and what decisions you could make. None of this is in the final game. There's more. "Sometimes we wanna test whether or not you come prepared," says Dragon Age executive producer Mark Darrah in the demo presentation. He then shows off a section where the player must set some boats on fire to prevent enemy armies from escaping. Of course, none of this happens in the actual game. Antivian Fire is real, but it's a combat grenade—you never use it to burn down boats. There's very little environmental interaction to the extent that was shown here. Wouldn't this have been cool? Maybe that'll be DLC one day? This entire segment—perhaps one of the coolest parts of the demo and a major selling point for Dragon Age: Inquisition—is maybe the most jarring to watch today. In this section, Mark Darrah walks us through the invasion and capture of a keep in the Western Approach—which is a lot different than the keep capturing we saw in the final game. As the demo player approaches the keep, Darrah notes that you can weaken enemy defenses by doing things like drawing out their troops or poisoning their wells. 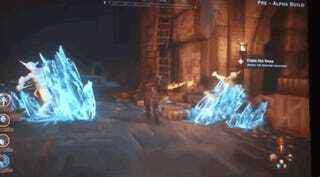 None of this actually shipped with the final version of the game, although in the Dragon Age we played, once you claim the keep you can get a quest called This Water Tastes Funny, in which your keep's well has been poisoned and you have to go find fresh water. Now we know who to blame for that. During PAX, BioWare put an emphasis on environmental destruction: There's a section during combat where the player can spot archers on a rickety bridge, then take them out by smashing a ladder and knocking them all down. Of course, games change in development all the time. It's fascinating to look at what Dragon Age: Inquisition once was, what the game BioWare debuted to the public could've been. We may never get to play some of this stuff... or we may eventually see it turn up in DLC. Either way, it's a small glimpse into the development of the game, and a reminder that what you see in a preview is often not what you get in the finished product.